Set within a conservation area and nestled around the banks of the River Great Ouse, the town dates back over 1000 years to the Medieval Priory of St Neot. St Neots is not in the Domesday Book but the parishes of Eaton Socon and Eynesbury were thriving as rural communities at that time. 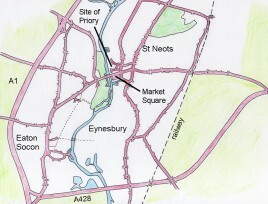 A small priory and settlement existed to the north of Eynesbury. Around 1080 the priory was rebuilt nearer the River. A market place was set out to the south of the priory and the present settlement grew up. By 1180 this became known as St Neot’s, named after St Neot, whose bones could be seen in the priory attracting many visitors and pilgrims. The town soon broke away from Eynesbury Parish and built its own parish church south of the High Street. The wealth of Eaton Socon depended on the agriculture, its position on the Great Ouse with its watermill and its closeness to the Great North Road. Local excavations have shown the Great North Road existed when the Romans came to England. 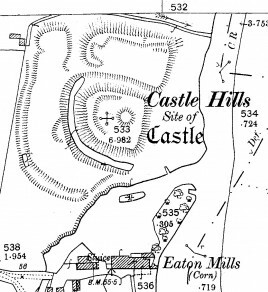 During the 12th century, a castle was built in Eaton Socon alongside the River Great Ouse with clear views over the countryside, the river and the watermill. The site is privately owned but the earthworks can be seen from the Eynesbury side of the River. In the early 14th century John, son William de Sudbury, held the manor of Sudbury, a settlement that once existed in Eaton Ford. In the 1320s, John represented Eaton at parliament. When King Henry VIII dissolved monasteries and priories the St Neots Priory was closed and the building materials used to build many local buildings. A few miles to the west, in the parish of Eaton Socon, Bushmead Priory was closed and became a family home. 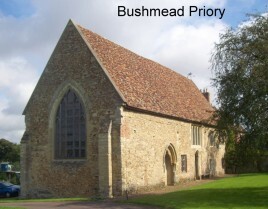 While just a few remnants can be located of St Neots Priory, it is possible to visit Bushmead Priory which is in the care of English Heritage and is occasionally open to the public. Up to the 20th century the three settlements of Eaton Socon, Eynesbury and St Neots continued with their three parish churches and local shops. St Neots slowly dominated Eynesbury, holding festivals and markets on the Square and the weekly livestock market. 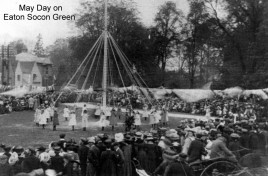 Eaton Socon was still in Bedfordshire and had its own festivals, including the annual May Day celebrations and autumn Statute Fairs. The arrival of railway in the mid 19th century had a serious impact on the village coaching inns. Industry at this time included breweries in St Neots and Eaton Socon and a brickworks in Eynesbury. In the 20th century each parish had its own schools with Eaton Socon having the first secondary school. Bushmead School opened in 1958 and Longsands in 1961. In 1965 the decision was made to build a new dual carriageway on the land to the west of the Great North Road. This split the old parish and all the land to the east of the road went into Huntingdonshire and the villages of Duloe, Staploe, Wyboston and other hamlets in Eaton Socon remained in Bedfordshire. In 1974 Huntingdonshire went into Cambridgeshire and as the town grew another secondary school was built in Eynesbury. Since this date the area between the A1 and the river has been steadily built up as well as the area between the river and the railway line. In the 1980s the southern bypass was built to reduce the traffic through the town centre. In 2006 development to the east of the town began, creating a new area known as Loves Farm, which is still continuing to grow now.